Greetings young reader! Today we are going to take a step back in time and enter the age of the dinosaurs. The dinosaurs are an extinct species of animal that began to live on the Earth over 200 million years ago. “Extinct” means that they no longer exist. The dinosaurs are some of the most intriguing and awe-inspiring animals that have existed on our planet. The dinosaurs’ colossal size, strange characteristics, and mysterious disappearance make them inherently worthy of study and interest. Even more than these reasons, the study of dinosaurs itself is an incredible adventure which requires thought and imagination. The study of dinosaurs helps you to appreciate just how mysterious and amazing life and nature really is. Our planet supports not only us and the animals that live today, but it even supported creatures as gigantic and strange as the dinosaurs- just think how cool that is! I hope that you bring a spirit of openness and wonder to your study of the dinosaurs, and that you come to appreciate the mystery and value of the dinosaurs. Today we are going to take a look at an incredibly fascinating dinosaur called the Archaeopteryx. 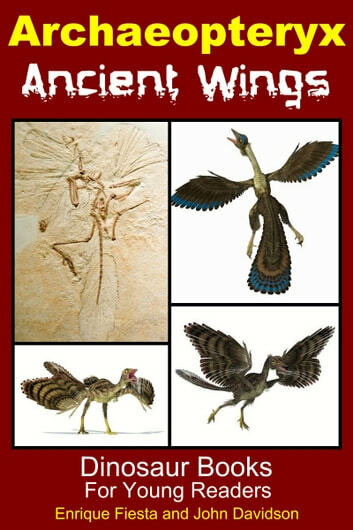 The Archaeopteryx is receiving a lot of attention today by scientists and paleontologists because of its dual nature: it was not only a dinosaur, but it was also one of the very first birds! This dinosaur’s status makes it a crucial to the evolutionary theory. Evolution is the theoretical process through which living things are thought to have come into existence. We will discuss this theory in the pages to come. We are not only going to talk about the Archaeopteryx’s relationship to evolutionary theory, but also about what the Archaeopteryx looked like, how it behaved, where and when it lived, and even about the plants and animals it shared its habitat with. We know what we know about the dinosaurs from a variety of sources including fossils, biology, and other scientific disciplines. Fossils are the ancient remains of the dinosaurs, the most familiar being their bones. Biological science is the study of life in general, but many scientists compare the dinosaurs to modern day animals to support their theories. Ally's Clever Joke Book! With Facts from the Past!